This is a super delicious recipe that I make every time I need something sweet and easy for guests or just us. For me this stands as a base for many cakes because of its versatility. That is because you can make it with almost any kind of fruit or ingredient of your liking. You can use fresh or frozen fruit and basically add to your batter any flavor you want. If you are a perfectionist, it will take a bit of experimenting with this cake in order to get the perfect quantities and texture, but it is totally worth it. As you will see below, my pineapple pattern was not perfect at all, but I will definitely try out again until I get it the way I want. It did taste delicious though. 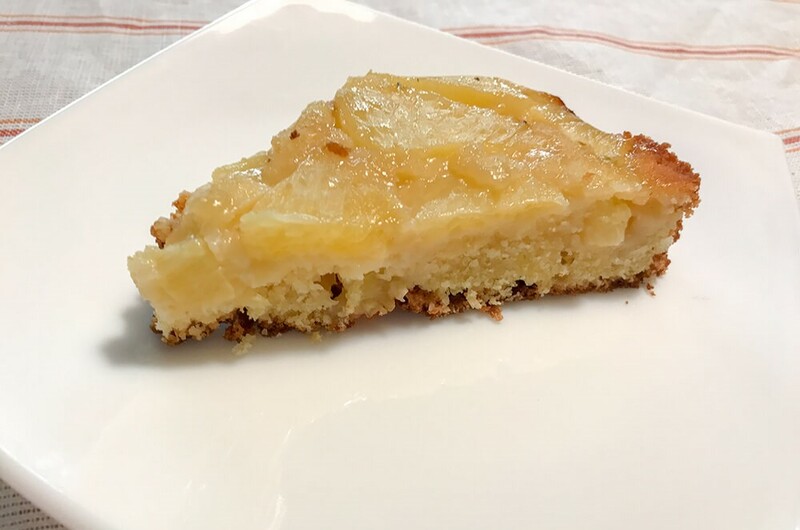 As we like cake extra-fruity in my family, I added extra pineapple into the batter as well, so this is a step you can skip if you want to try a classical approach to the recipe. Below you will see my super easy recipe for an upside-down pineapple cake. Enjoy! Preheat oven 350°F / 180 °C. Grease a 9″/23 cm cake pan with butter. Melt 8 tbsp of butter over medium to low heat and add sugar. Stir until dissolved and continue stirring occasionally for a couple of minutes until you get a thick paste. Pour the thickened syrup into your greased pan and arrange pineapple on top in a pattern of your liking. Set aside. In a medium bowl, mix together the flour, baking powder and salt and set aside. In a large bowl, beat the sugar and soft butter with a mixer set on medium to high speed for about 5 minutes. Add the 3 eggs one by one, mixing after each for about 1 minute. Incorporate vanilla. Add half of the flour and mix on low speed. Add juice and mix again until all is well incorporated. Add the second half of flour and mix in manually with a spatula, from bottom to top, to avoid over mixing. Optional step: Add small pieces of pineapple into the batter. Carefully place the batter on top of the layered pineapple with o spoon or spatula. Bake for 40 to 50 minutes or until a cake tester comes out clean. Cool for 5-10 minutes and turn it upside down on your cake plate.